The key to being comfortable while standing with the banjo is to adopt a position that’s similar to the position you use when sitting. If you’ve found a good sitting position, stand up with the banjo and watch what happens. Try adjusting the strap length so that you have little to no change in the position of the banjo for both your sitting and standing positions. Note also the relationship of your hands to the instrument as you both sit and stand. You want these positions to be as close as possible to one another whether you’re up or down. Keep your arms relaxed and your elbows bent while standing and remember not to raise the peghead above eye level. Your left hand should easily be able to fret at any point along the banjo fingerboard, and your right hand should have easy access for striking the strings. 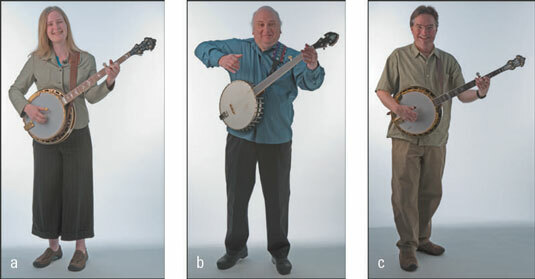 The figure shows three different ways of standing while playing banjo. Erin (a) holds the banjo a little lower and off to the side of her body. Jody (b) angles the banjo neck a little higher and holds the banjo a bit more off to the side, while yours truly (c) holds the banjo higher on the body and more out in front. All are fine ways to take a stand for better playing. Even experienced banjo players still have to make a subtle mental adjustment every time they stand up to play. A day or two before a performance, a player might devote a share of his practice time to playing standing up so that he’ll feel more comfortable playing with others on stage. At a festival, you spend a good deal of your time standing in a circle of musicians at jam sessions, so practicing while standing up is a great idea every now and then (and don’t forget to bring a comfortable pair of shoes!). Erin (a), Jody (b), and Bill (c) use straps for standing while playing and hold their banjos slightly differently.